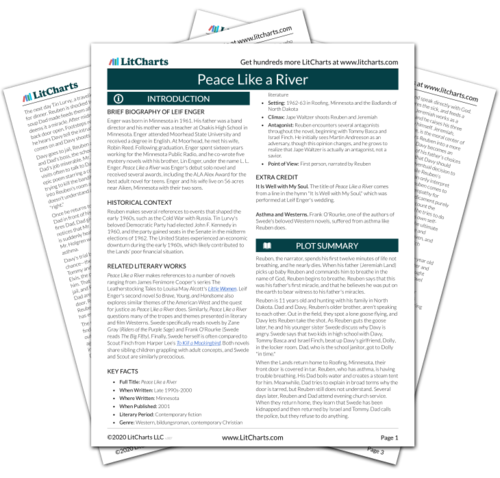 Instant downloads of all 945 LitChart PDFs (including Peace Like a River). 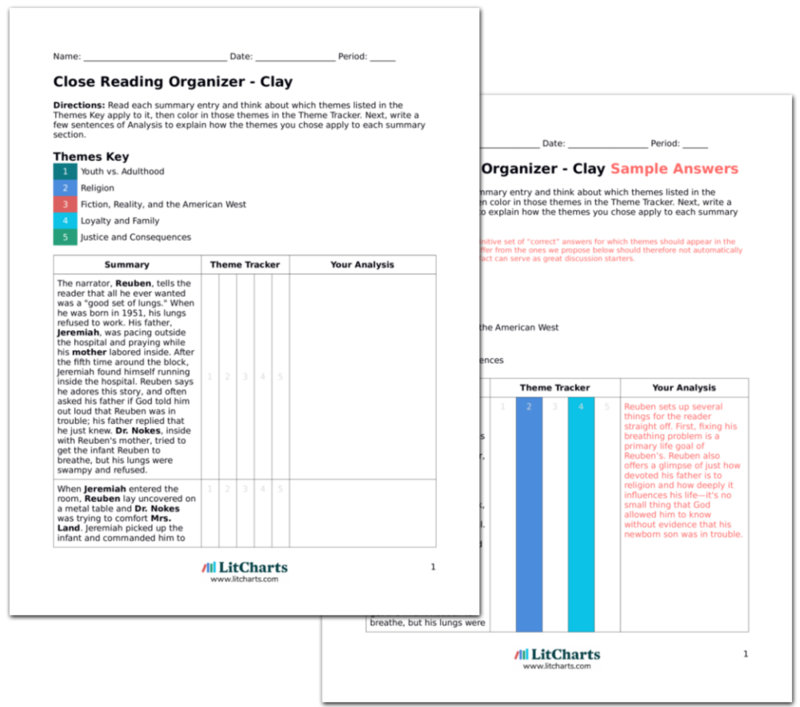 LitCharts assigns a color and icon to each theme in Peace Like a River, which you can use to track the themes throughout the work. Roxanna serves her guests a fantastic meal. Dad looks content and Swede appears deep in thought. Roxanna tells them that she grew up in Montana. Her mother died when she was young, so she grew up motherless like Reuben and Swede are doing. She learned how to ranch from her father, and later helped him run his movie house in Lawrence, Montana. Swede asks if Roxanna met movie stars, but Roxanna says she only once met a famous screenwriter. Swede seems disappointed. This is Reuben's first mention that growing up motherless is even something he dwells on. Meeting someone else similarly motherless offers him a way to connect to Roxanna, while Swede continues to connect with Roxanna through the West and fiction. However, even Roxanna's experience of the West and of movies like this isn't as satisfying in real life. As Roxanna talks, Dad leans back and seems very happy at how their evening is playing out. Reuben remarks that by this point Dad had been so long without a wife that this sort of dinner with a woman was probably like "a favorite hymn remembered." Reuben thinks of how lonely Dad must be. Dad asks Reuben how his breathing is, embarrassing Reuben. He tells Dad it's fine and he and Swede head to bed. Even if the West of North Dakota isn't what the Lands expected, it affects Reuben and forces him to grow up and see his father as a whole, lonely person. In this way, the real West is shown to function in the real world like it does in fiction. It remains a transformative force. That night Reuben dreams that a creepy little man with a bag made of skin comes to steal his breath. He wakes, scared and confused, to Swede crying, Dad holding him, and someone thumping his back. In his confusion Reuben tries to break free, but sees that Roxanna is the one hitting his back. After 20 minutes Reuben's breathing eases. Roxanna goes downstairs to boil water for Reuben. Roxanna slips right into the Lands' lives without a second thought. She seems already like she cares deeply for these children she met less than 12 hours ago. This suggests the possibility that her presence in their lives is meant to be and is the will of God, showing again the power of religion and prayer. When Reuben wakes the next morning, he looks out the window to see snow hip deep. Swede is gone from her bed, and Reuben yells for her. The house is empty, and Reuben looks out Dad's window. He sees Dad, Roxanna, and Swede shoveling a path to the barn. Reuben tries to yell for them to wait for him. He runs to his room to get dressed, but finds that after yelling he can barely breathe. He sits down and listens to Swede's happy yells. Reuben feels horrible for himself as he crawls back into bed. He thinks that even God isn't inside this house; He's surely outside having fun with Reuben’s family and Roxanna. Reuben's health is taking a turn for the worse--in this case, the West is still transformative, but not in a good way. Notice how deep Reuben's loneliness is, and particularly that what makes it unbearable is God's absence. This not only humanizes God (who's outside having fun), it shows how much Reuben relies on religion to remain hopeful and happy. 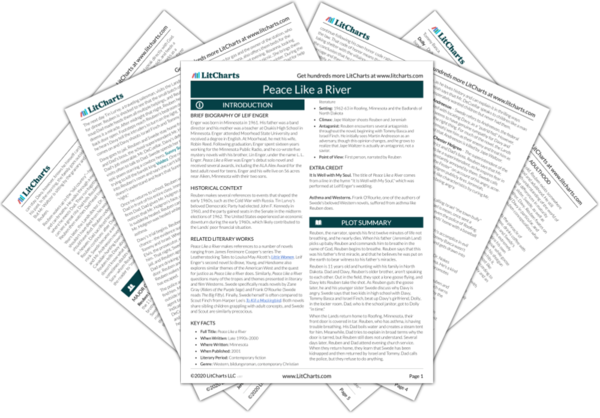 Get the entire Peace Like a River LitChart as a printable PDF. Swede wakes Reuben up several hours later, excited by the deep snow and the fact that Dad decided they're going to stay another night with Roxanna. Reuben is too engrossed in his own self-pity and says that they're not going to find Davy if they stay. Swede retorts that they can't leave anyway, and begins to describe the wonders of the barn. Reuben tries to turn the conversation back to finding Davy, but Swede fixes Reuben with a disgusted expression and accuses him of feeling sorry for himself. For the first time in the novel, Swede has found a happy escape from difficult realities in an experience that takes place in reality rather than fiction. Notably, this distraction is exciting enough to distract her from thoughts of Davy. This suggests that the power of real experiences can be greater than that of fiction. Reuben tackles Swede to the ground. Swede easily wins the scuffle, stands up, and yells at Reuben to watch her breathe and do jumping jacks. Reuben can barely breathe, but manages to say "uncle" at Swede's prodding. Reuben feels nearly friendless now that it's apparent his own family is sick of his asthma. Swede looks concerned and asks Reuben what's wrong with his lips. Reuben answers that she went outside without him, and Swede starts sobbing. They sit on the floor together, Swede crying and Reuben trying hard to breathe. Reuben feels betrayed by his family and Swede specifically on all fronts. She got to experience the barn, while Reuben didn't even have the comfort of fiction or religion to keep him company inside. In Reuben's mind, Swede even had God outside with her. Reuben's illness is also getting worse; he's not getting enough oxygen to maintain normal color. Swede confesses that she really did forget about Davy for a while. She says she likes Roxanna, and they agree that it's better they stay. Reuben says to the reader that the fact that they're snowed in at Roxanna's is surely the work of the Lord, as it probably seems to the state troopers like they vanished. Again, Reuben engages with their predicament in terms of how it looks from a fictionalized standpoint. He also again attributes their situation to God, reminding the reader of how much Reuben relies on God's guidance. Reuben asks when they're going to leave, and suggests they'll probably get arrested as soon as they hit the road again. Swede finds the idea that they're fugitives thrilling. Reuben calms her by reminding her of Tom Sawyer. He says that running from law enforcement is a privilege and they shouldn't blow it by telling Roxanna about their situation. Swede wants to swear an "appalling oath" in blood, like Tom and Huckleberry Finn, but Reuben steers her away from this idea. The idea that running from law enforcement is a privilege shows that Swede and Reuben still see their journey west as an idealized, grand adventure. Reuben demonstrates his maturity by suggesting they not take this idealization to the full, dramatic, literary conclusion of a blood oath, while Swede looks even younger in comparison. It takes the county snowplows days to reach the house, so Reuben and Swede fill their days helping Roxanna with chores. One day, as Roxanna cleans out the goat pen, Reuben asks her why she has a picture of the “Wild Bunch” (a historical outlaw gang). Roxanna says that her great-uncle knew Butch Cassidy, and Swede is awestruck. Reuben and Swede now have the opportunity to romanticize daily farm chores. Swede's awe stems from the fact that though the Wild Bunch was real, she only ever thought about it as though it's fiction. Now it exists in Swede's mind like her saddle does: idealized, but a real thing. Roxanna explains that her great-uncle Howard had been a gunsmith and a doctor and was known for his cinnamon rolls. One day, upon returning home from church, Howard found a boy on his steps, asking if Howard would look at his gun. Howard allowed the young man into his kitchen and deemed the gun to be unfixable. The boy looked distraught. Howard offered him a cinnamon roll, and the boy introduced himself as Butch. Howard offered to sell Butch a similar gun from his own collection. They negotiated a deal for the gun and eventually became friends. Howard even occasionally "dabbled in outlawry" with Butch. The tale is fantastical but again, the reader (and the children) is asked to take it as fact that Roxanna's story actually happened. This continues to blur the line between fiction and reality, while continuing as well to situate the West as a place where fantastical events like this can happen. It also provides Roxanna's character with even more mystery and allure, especially in Swede's eyes. Dad enters and says that the snowplows are coming. He tells Roxanna that they can settle up and leave tomorrow. Reuben and Swede can barely stand the idea of leaving. Roxanna smiles at Dad and asks him if he's in a hurry to leave. Reuben explains that none of them were truly in a hurry to leave, and they stayed as long as they did mostly because Dad hadn't received any instructions from God as to where to go next. Though Reuben and Swede see being at Roxanna's in the first place as an act of God, they can't make sense of why they haven't received instructions. This suggests that there's some dissonance between what they believe God wants them to do and what will actually happen. This reinforces the idea that religion is powerful, but it can also be confusing. After the plow passes, Dad instructs Reuben and Swede to pack their things. Swede is extremely upset, and isn't comforted by Reuben's suggestion that Dad heard from God about Davy's whereabouts. In her anger, Swede throws her toothbrush at Reuben. She asks him if he really believes that God told Dad where Davy is, and when Reuben answers no, she tells him to shut up. Suddenly, Swede and Reuben discover that they've found something better and more fulfilling than being on the road in the Wild West. This continues to show that the West, while alluring, isn't all it's made out to be. There's value in staying put and experiencing a sense of family and community. When Reuben and Swede enter the kitchen for supper, they find Roxanna standing at the counter. She turns around and smiles at the children, holding a full picnic basket. Reuben and Swede are dumbfounded by her beauty. The description of Roxanna mimics descriptions of artistic representations of the Virgin Mary, suggesting that she's taking on those holy qualities and becoming more like Dad. Brock, Zoë. "Peace Like a River The Skin Bag." LitCharts. LitCharts LLC, 25 Aug 2017. Web. 23 Apr 2019. Brock, Zoë. "Peace Like a River The Skin Bag." LitCharts LLC, August 25, 2017. Retrieved April 23, 2019. https://www.litcharts.com/lit/peace-like-a-river/the-skin-bag.